If you’re like me, you might find yourself on a salad-kick after the weekend— especially when one’s weekend includes an overload of holiday party food and some extra trips to the Christmas cookie jar. Don’t make yourself feel guilty for it! Instead, take Monday to regroup and get back on track to eating more healthfully. For me, that means adding one or more salads to my weekday menu. I’ve outlined my easy salad strategy into 5 Steps to Building a Better Salad, with the most important being limiting the dressing [in my opinion]. Salads are definitely a way to go to increase your fruit, vegetable and grain intake but there’s one area of caution when it comes to building a better salad: THE DRESSING! It’s a lot easier than you might think to make your own dressing at home. The benefit? You control the ingredients— limiting unwanted fat, sugar, or salt. The bottom line? Salads are fresh, full of nutrients, and highly economical when you make then with ingredients that are in-season. 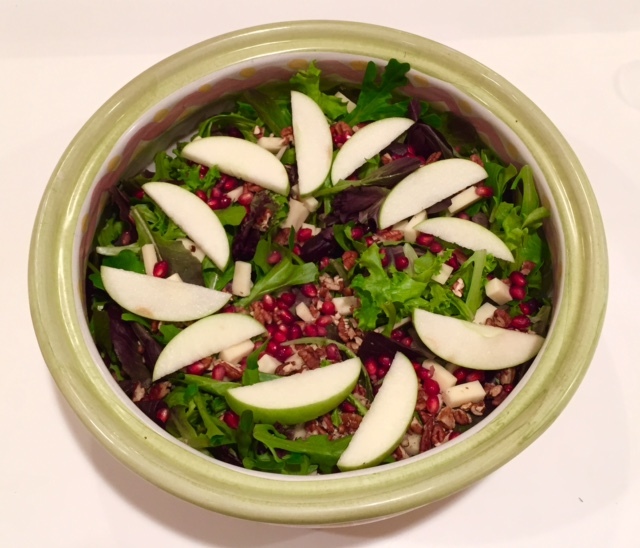 My favorite in-season ingredients right now are pomegranate seeds and green apples. Mixed with some leftover chicken, cheddar cheese, and walnuts, and baby you have yourself a meal! No, not all of my salads look this put together! But I made enough to photograph and save for a few meals this week. The key to saving leftover salad is to only use dressing on what you’ll eat— otherwise the greens will get soggy! How about you? What are some of your favorite salad recipes or flavor combinations for an easy weekday meal? What a great post! I make a massive almost every day for lunch and follow this exact formula. My new favorite additions are raw sunflower seeds and salsa in place of dressing. Love salsa as a dressing sub!! Such a clever idea! I love this! 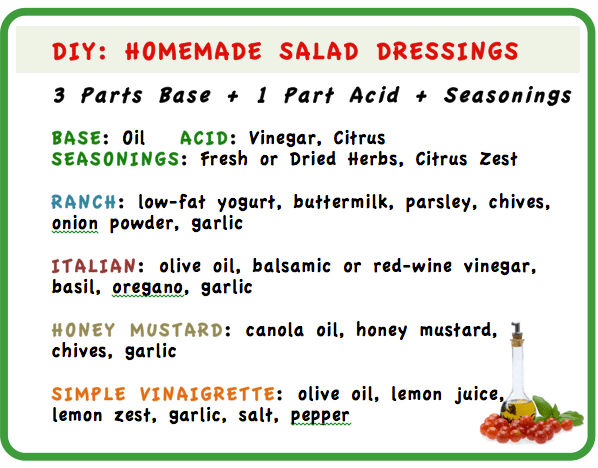 What a great reminder for balancing salad dressings. Thanks for sharing! Great dressing ideas. I really should make my own more often! I recently started eating salads with kale – after marinating in dressing for about an hour, its just the right texture. Good thinking on the kale— I’m afraid to use it in salads for that very reason!!! Love these ideas! Your easy formulas are great! I’m glad you found them helpful!! Katie, I *love* this post! I love salads, but don’t make them at home nearly enough. The beautiful thing about them is, that you can use so many different variations – which makes me wonder why I am not on the salad making train! This makes me want to get on-board!!! Love it – such a great post! Agreed, Kristi!! 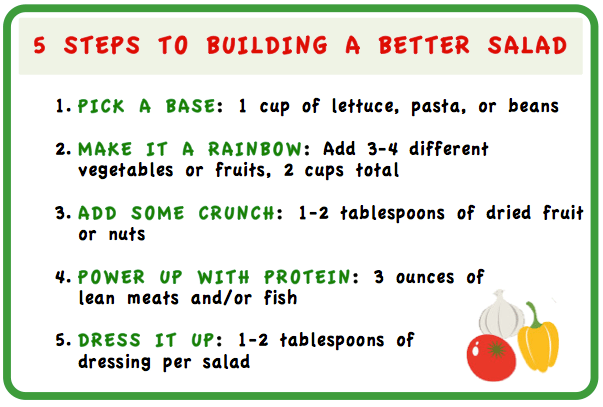 I tend to get into a rut with ingredients, so glancing at these tips every now and again gets me out of my salad rut!! I would love to make this into a wallet sized card and give it to my clients for a handy guide when grocery shopping! This salad looks so delicious, and love that it’s so healthy.